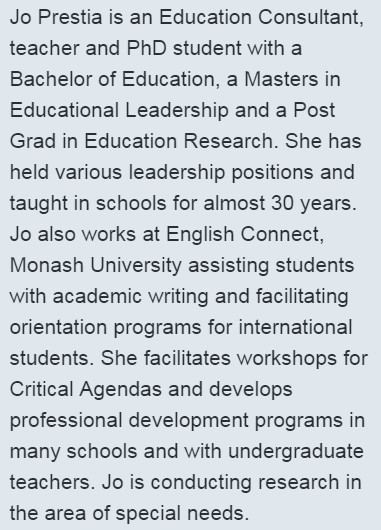 This week’s blog is a conversation with Jo Prestia (follow her on twitter) about data in education. It started on twitter and couldn’t be contained within 140 characters. Enjoy. Joel: Hi Jo. I read your blog last night (check it out here) and I was particularly struck by mentions of data in education. Data-driven practice is promising but I feel we’re missing the mark. Thoughts? Jo: Hey Joel. Thanks for reading my post. I think educators are keen to use data but seem to depend heavily on data from standardised/diagnostic testing. Educators forget data is everywhere and can be collected and analysed in real time instead of having to wait months for processing. Joel: You’re referring to NAPLAN? Is it useful data for the average teacher? Jo: Yes NAPLAN. I do believe that over many years NAPLAN could serve as an overview for schools but the data is disconnected from the student, results arrive too late to make any impact. It’s only a snapshot in time and as a standalone means very little. For the average teacher, number crunchers can formulate graphs and show where students were at, but is it useful? I’m not sure teachers actually know what to do with the data once it is presented. Joel: I think there’s a big difference between “data” and “information”. Data is just long strings of numbers whereas information actually makes sense and is useful. Jo: hmmm yes I agree Joel, data is different from information. Information gives data more scope so to speak. It goes beyond the number crunching and into a more humanistic tool. Joel: So, let’s work from an idea that NAPLAN data isn’t particularly useful. How about data from end of term exams or other school-based assessment. Is this more useful? Jo: School based assessment certainly is more useful in that one would hope it has been designed to suit students’ needs and extend their learning. School-based assessments are usually assessed by the teachers themselves and allows for more realistic feedback, where students can see where they are in time for the next round of learning. I always encourage staff to give feedback on the last piece of assessment before contemplating the next. Jo: Wait isn’t that what data is for? Feedback? These assessments give real time data that can be used to inform teaching AND learning. Joel: Ok, I’m with you, feedback to the teacher on the student’s learning, feedback to the student on the student’s learning. Jo: Yep, but there’s also formative assessment, data that can be combined/added to create a more holistic picture of teaching and learning. Joel: It doesn’t seem like we’re talking about “number data” anymore. Jo: As the well known Glaser dictum goes… “All is data”. So… we should be collecting data in all forms, number data, observation data, reflective data … is that too much? Is it even possible? Joel: Well, the promise of “big data” is that you collect a bunch of stuff and from that comes useful information. But “big data” is collected by google and facebook, companies with a lot more resources than us. I think as teachers we need to be collecting our data a little more discriminately. Data that will give us the information we need to better serve our students. As to what that data is… I’m not sure. Jo: Perhaps the data we collect is different for each class we teach? Let’s revisit the idea in my post – practice-based evidence. Joel: As opposed to evidence-based practice, which we’ve all heard about, what’s practice based evidence? Jo: For me it’s the difference between show me the data and I’ll show YOU the data. In an educational setting it would mean a systematic collection of data about a student’s progress during their learning in order to enhance further learning. Joel: You’ve got me at systematic collection of data I like the idea of teachers collecting data in their own classroom and we certainly have the means to do that now. Jo: Ok, let’s expand this idea – teachers collecting data in their own classroom – how? Joel: We’ve been doing it for a long time with attendance. We could also collect data on homework completion, perceived effort, behaviour…Not letter grade data or percentage data but “soft data”. Jo: Sounds interesting, so how would you collect the data? Joel: How about students self-assessing themselves each lesson via an online survey, Survey monkey or a google form or similar. Would this self-reported data be useful? Jo: Now you’re talking. I think this would be an excellent way to gauge student understanding. What kinds of question might you ask? Joel: I was hoping you’d tell me. I suppose we need to work backwards. What information do we want? If we know that, then we can create questions to gather that info. What do we need to know? What they took away from the class? What they would like to know more about? How it might be improved? Are these questions too much for them to complete after each class? What about before we actually begin the class – what might we want to know at that point? How confident are you with the work we covered? How much do you think you learned today? How would you rate your behaviour in class today? How many questions did you ask the teacher today? How much did you contribute to class today? If I collect data in this way I can turn it into information more easily via averages or graphs. Jo: Makes sense and much easier to collect than mine. Joel: But I like yours! In the end it comes down to intent right? What do YOU want to know? Jo: Yes but I could still collect mine as qualitative data at the end of a unit or semester and combine the everyday data to ‘grow’ my little data into BIG data. What about that? Joel: It seems like a winning idea. Teachers curating datasets that make sense to them individually rather than waiting to be handed NAPLAN data or the like, which is so far removed from their classroom. Jo: And there you have it – reflective practice, students showing us the data – practice-based evidence. Joel: Practice-based evidence it is. It’s been a pleasure Jo. Jo: Thanks Joel, the pleasure was all mine. Hope we can do it again sometime. Got something you’d like to add to our data conversation? Comments welcome below. This sounds fantastic Joel. I’d love to collect this kind of data. Now tell me how to use the technology to gather and collate it please! Hi Kylie, gathering it would be super simple with something like google forms. I’ve written a tech tip tuesday before about using google forms to do auto-marking quizzes, but using it as a simple survey is even easier. Check the Tech Tip here. http://joelsperanza.com/tech-tip-tuesday/google-forms-quizzes/ Once you’ve got the data in a spreadsheet, you can have all sorts of fun with graphs and tables in google sheets.